I've finally -- finally! 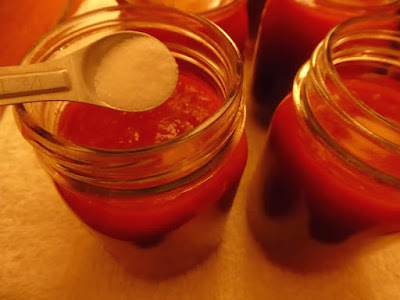 -- finished the tomato sauce. This was a long journey that began in June when we planted 16 tomato plants. 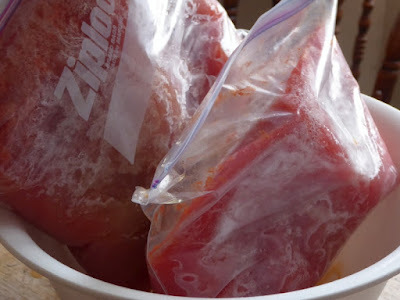 We harvested a few tomatoes here and there, and as I harvested them I used the food strainer to purée them, then froze the purée. ...and puréeing them, the freezer was stuffed with purée. I didn't want to start cooking down the purée into tomato sauce until two things happened: One, all the green tomatoes had ripened; and two, the cookstove was in constant use (as opposed to letting it go out during the day). 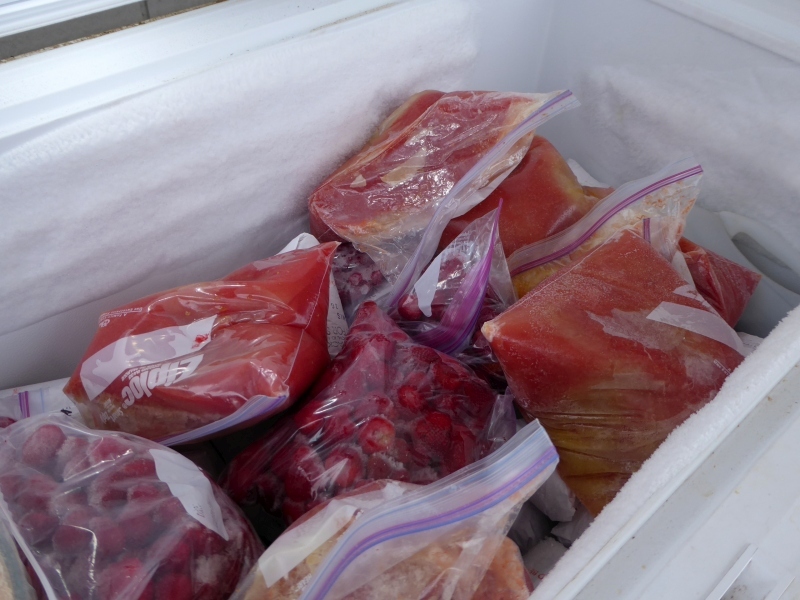 As December's temperatures dropped and the cookstove was always hot, I started processing the purée. I defrosted four bags at a time. By letting the frozen bags defrost overnight, some of the watery portions leaked out of the bag and into the bowl. Just that much less to cook down. Then it was time to pour it into a large stock pot. I nested two pots double-boiler style and parked them on the stove. About three times a day, I topped off the water in the lower pot so it wouldn't boil dry. I didn't use a lid, since I wanted the liquid to cook down. I stirred the purée a few times a day. After one night of cooking, you can see how far down it reduced. It took about three days for each pot of purée to reduce to sauce consistency. And while it made the house smell rich and tomato-y during this process, I had to repeat it three times to use up all the purée in the freezer. 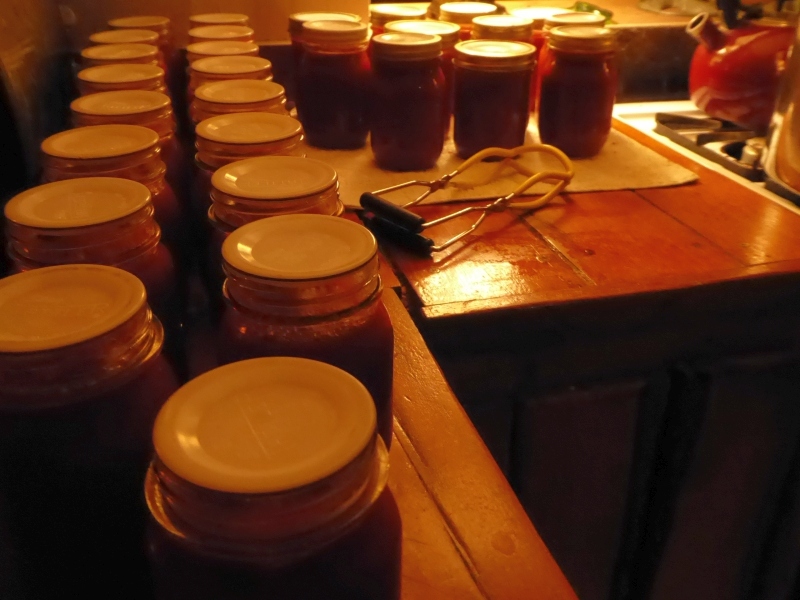 Nine days of smelling cooking tomatoes got to be a bit much. 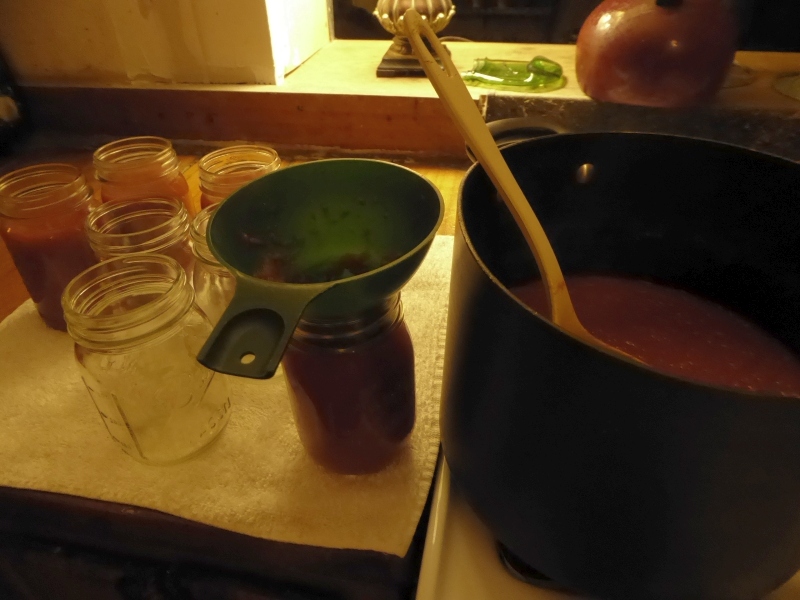 You can also understand why I wanted to use the passive heat from the cookstove to make the sauce. 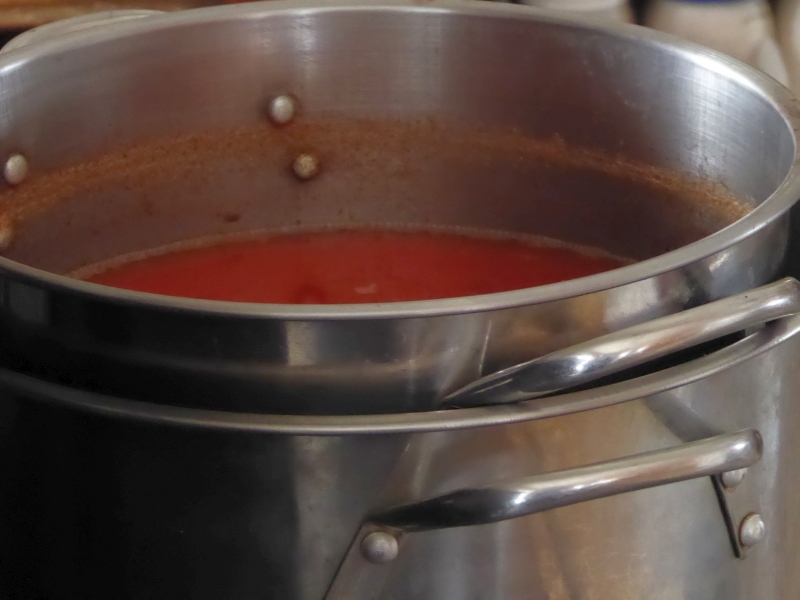 Nine days of cooking the sauce on our propane stove would have used a lot of propane. I re-froze the first batch of tomato sauce, figuring I'd defrost and can all the sauce at once; but that was the wrong thing to do since I had to re-defrost the sauce and heat it thoroughly (tomato sauce should be hot-packed), plus I could only process so many jars at a time. 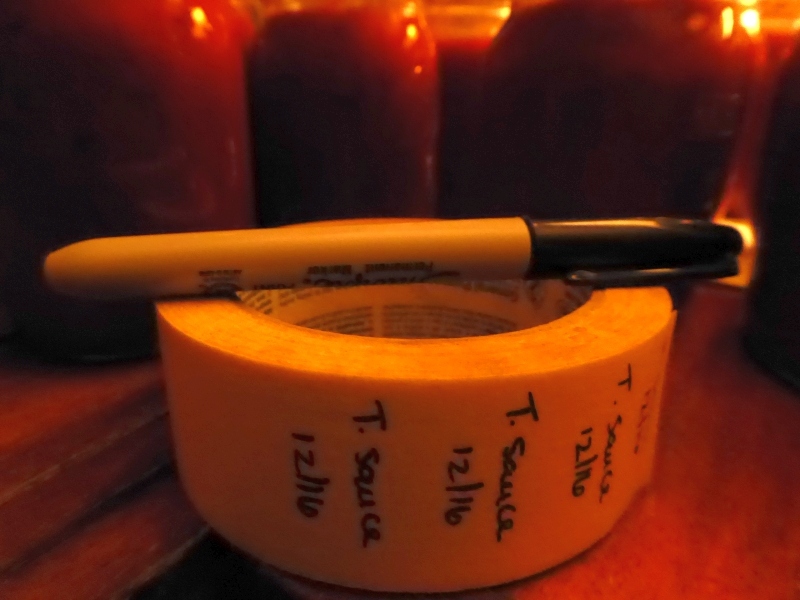 So from then on I just canned each batch of sauce after it cooked down and while it was still hot, and this worked out far better. Tomatoes can be water-bath canned (unless there are additives like onions or bell peppers). 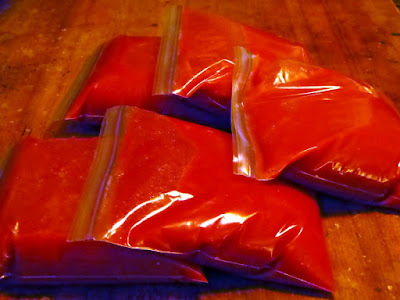 I never flavor my tomato sauce because I like it to be "generic." That way I can take a jar and flavor it however I like, such as Mexican or Italian or whatever. Because the acid content of tomatoes, even heirloom varieties, is never assured, it's necessary to add an acidifier. Into the water bath for 30 minutes (actually, about 35 minutes adjusted for our elevation). By the time the third and final batch was cooked down and canned up, I was thoroughly sick of tomatoes. Fortunately that feeling is tempered by the utter satisfaction that comes from concluding a project which was home-grown, from beginning to end, on our farm. One of the many reasons I love canning. 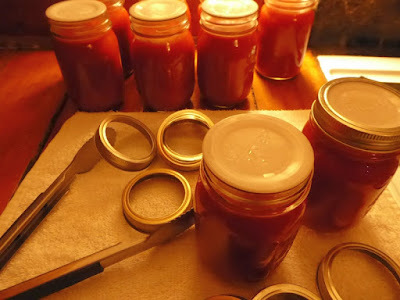 I'm starting to venture into non-jam canning. I recently picked up my first set of Tattlers. I've noticed that you remove the rings after everything has sealed. Is there a particular reason why? Once an item is canned, a ring is superfluous for storage. The ring doesn’t keep the jar sealed, the pressure inside the jar does. If I had a ring on every jar of stored canned food, I’d have thousands of rings (smile). As it is, I only have a few dozen rings, and they can be used over and over. 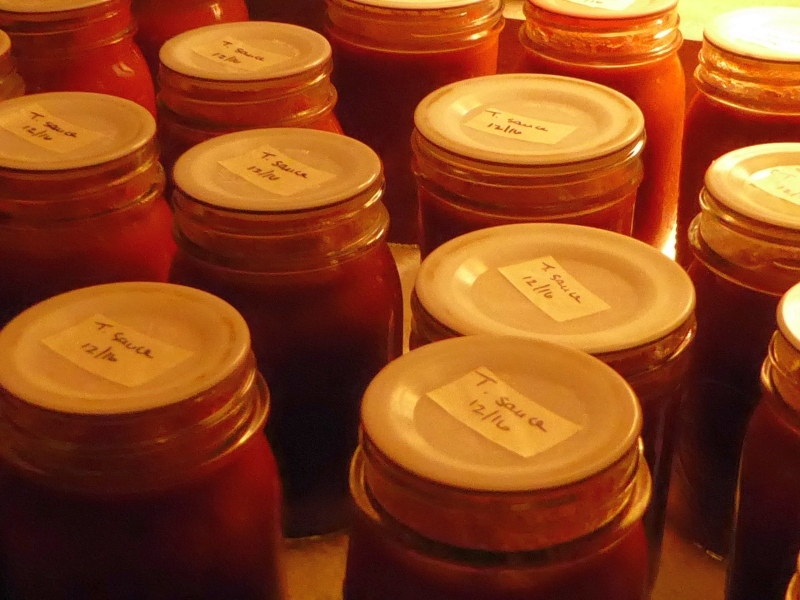 Rings left on jars tend to get rusty, especially in humid climates. Additionally, a jar stored with the ring on gives a false sense of security. If the seal of a jar is compromised and the lid comes loose, a ring will still keep the lid in place. Without the ring, however, you know in a moment whether a lid is loose or not. When canning with Tattler lids, be patient with yourself as there is a bit of a learning curve with them. The rings should be gently tightened when jars come out of the canner, then left in place until the jars are completely cool (about 12 hrs or so). After that, the only way to tell if a Tattler lid has properly sealed is to remove the ring (the lid will just come off if it hasn’t sealed). Again, leaving the rings on gives a false sense of security; but in properly canned food, rings aren’t necessary during storage. 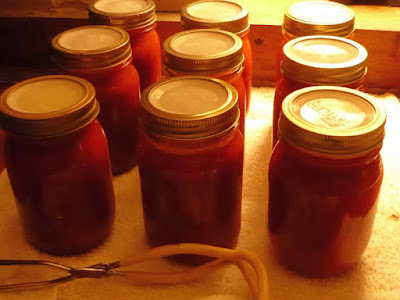 I canned sauce this year for the first time from home grown tomatoes. Gave away a bunch as Christmas gifts to family members that don't make their own sauce. Gave several jars to my daughter who came home for Christmas. Her boyfriend asked could he please have some too. Glad everyone liked it. It tastes so much better then the processed stuff and I know what's in it. 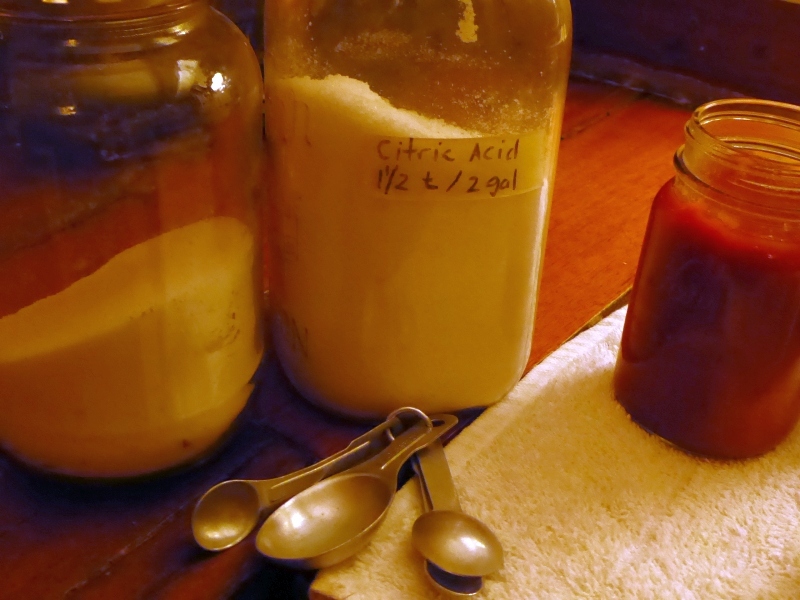 Now that your family is down to 3 people are you using pint jars more than quarts? My family is down to 2 people and a quart is just to much for us. I really wish that I had purchased more pints now. 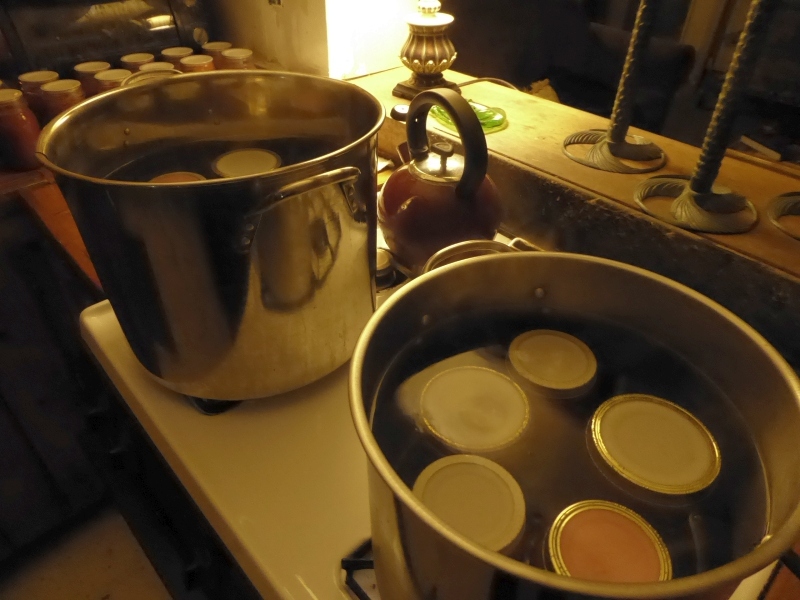 I've always canned in pints more than quarts, so we have plenty of pint jars. I agree with you -- we use them more than the quarts. we did not do any this year as we still have allot, what i saw made my muth water was thinking of what you could do with the green ones, "FRIED GREEN TOMATOES", YUMMY!! and here in the southwest add some green chile and it is out of this world! We just bought an old cook stove and 'wrestled' it into our garage. That thing is a beast! We all commented that we couldn't imagine moving it in and out of the kitchen each summer! They were much tougher folk then, no doubt! Really is a lot of work, but well worth it. I ended up with about nine gallons this year. I finally broke down and bought one of those hand crank processors that looks like yours. That thing is wonderful. I'll probably try it on the black raspberries next year. 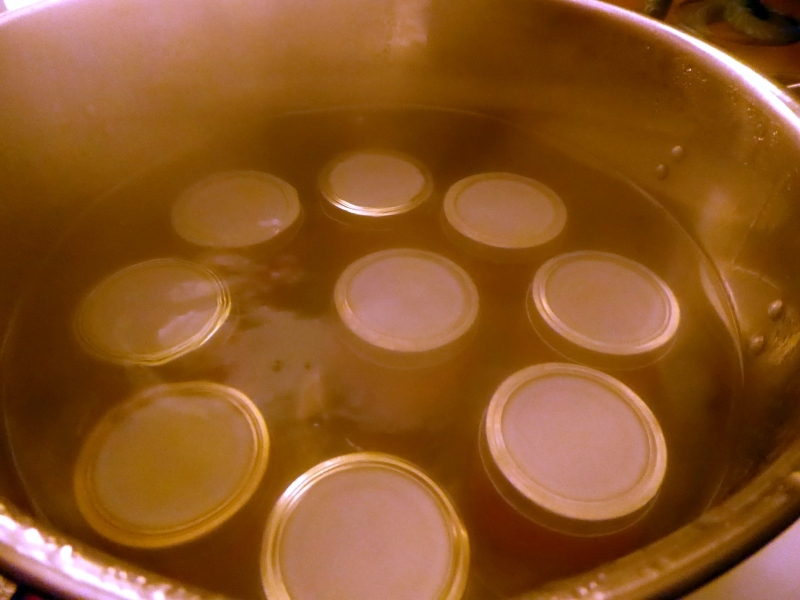 The water you drained off the original sauce is very good canned and added to soup as a liquid. Hi has anybody got a way of getting canning tops off the jars I have 2 that are really stuck I have tried heat, freezing ,prising with a knife. I am begining to think I shall have to through the jars away. ?? Wow, I've never come across that problem before. Have you tried using a bottle opener? We have a bottle opener built into our little hand-operated can opener. We often use it on stubborn lids (NEVER on Tattler lids, as a bottle opener will damage the gasket). Well, of course, it's too late now, but rather than spend days evaporating water from the sauce, I do it a bit differently. When I bring in the tomatoes, I wash, core and put in a large pot with very little water. I let them cook down until soft. Then, I put them in a large colander lined with an old (but with no holes) pillow case. 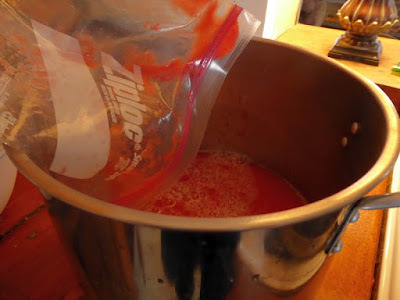 I allow them to drain that way until I can handle the pillow case without burning my fingers and then I start twisting from the top and let that pressure squeeze out the water. As the water drains out, I twist the case tighter. Finally, when most of the water is gone, I put the pulp through my Vitorio strainer to separate seeds and skins from pulp. I then freeze this till I have time or till all the tomatoes are done and just can it all at once. Hooray! I just noticed however that your year is 2016 on your stickers! That's because I canned it in December (smile). Oh man sorry! I read it quickly as 1/2/16 sheesh! 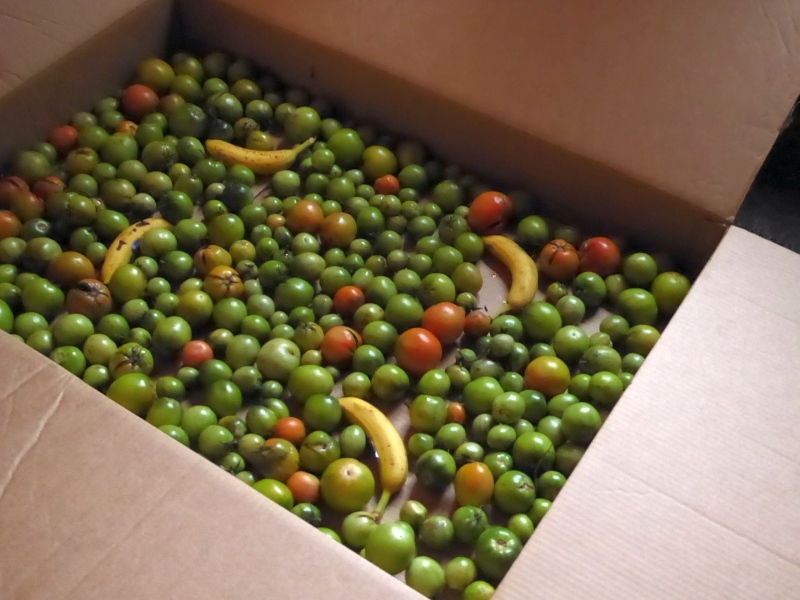 I must be missing something ... why are there bananas in your tomato ripening box? Bananas release ethylene, a natural ripening agent. 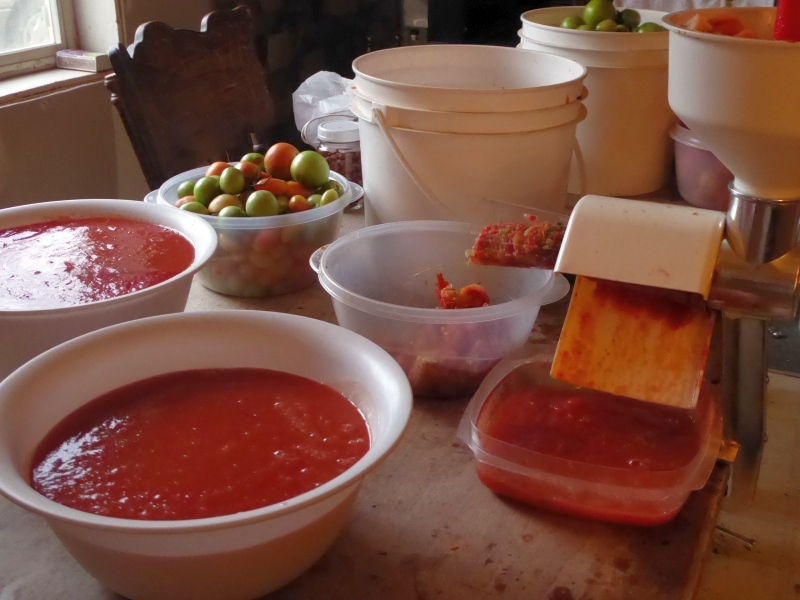 In the closed environment of the box, the tomatoes slowly ripened over a period of weeks. Nifty little trick. I live in a place where that trick wouldn't work nearly as well, enough that we'd think that people were having one on with us. Why it works for you: Idaho soils are low in selenium, as are the soils of the Pacific Northwest region in general. Why is this important otherwise? I've always wondered why the Pacific Northwest has high incidence of auto-immune and endocrine disorders. Do I understand you correctly, you got all that condensed sauce from only 16 plants? How many pints was that? I think I see 28 jars. Is that correct? Based on my experience that's impressive. Kudos! I bought one of those stainers based on your story and it made Tomato sauce possible for us. After doing it the old way I decided I didn't want sauce that bad. Hi Patrice! Loved reading about your tomato sauce making. I love to do stuff like that, too. 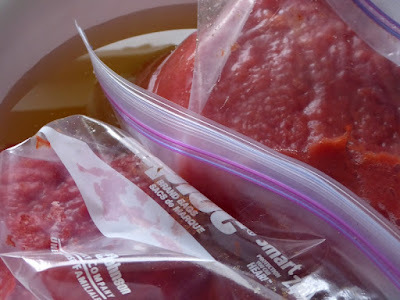 When you said,"By letting the frozen bags defrost overnight, some of the watery portions leaked out of the bag and into the bowl. 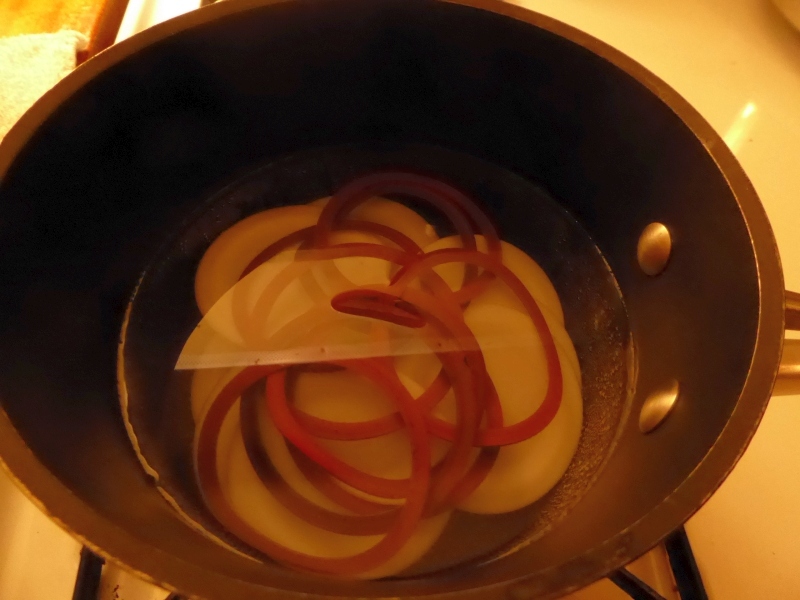 Just that much less to cook down", a little alarm went off in my head. Ah, that watery portion. I always jar that part up to use for soup base, etc. But the BEST use I've found for it is to replace the water called for in my homemade Italian bread. 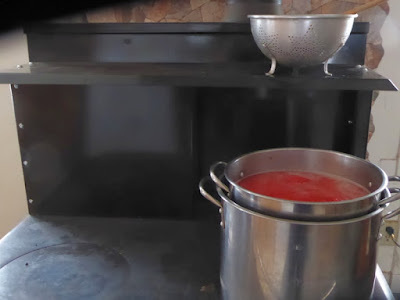 For some reason, this watery juice from the tomatoes causes the bread to be extremely tender. Yum! Some day when you have some extra, give it a try. You'll be glad you did. "By letting the frozen bags defrost overnight, some of the watery portions leaked out of the bag and into the bowl. Just that much less to cook down." Hey, Patrice! 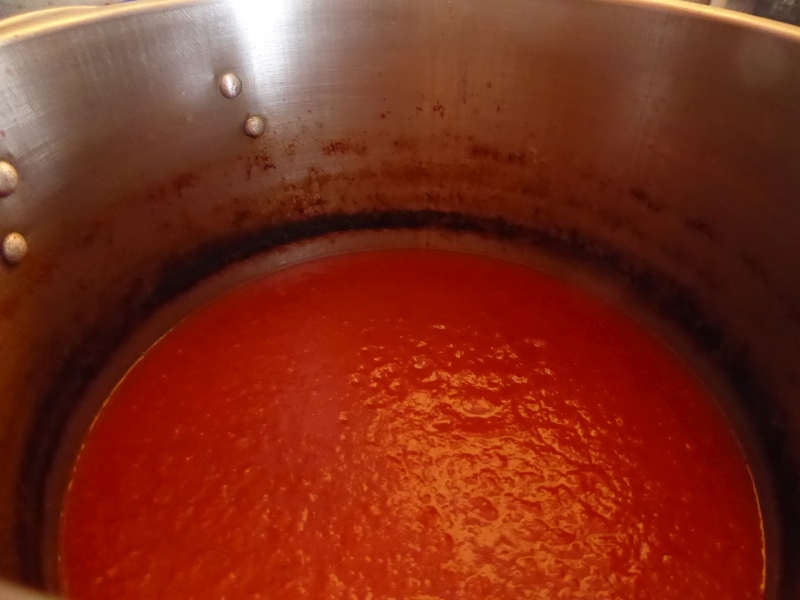 That's some good-looking tomato sauce. I like to save the watery stuff and can it up separately. Then I can use it for soup bases or - my favorite way - in place of the water called for in my homemade Italian bread recipe. It makes a very tender-crumbed bread. Give it a try sometime. You'll be glad you did!